On the wall of my living room are two watercolors of St Ives given to me more than fifty years ago by my first serious boyfriend who was a painter. His British Council fellowship in 1957 included a trip to Cornwall and upon return he kept telling me that there is no more beautiful place in the world than St Ives. 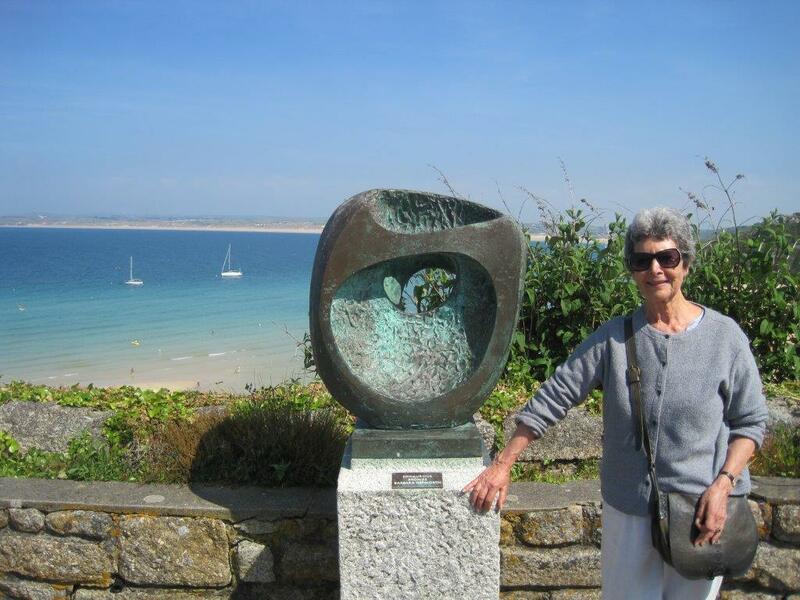 My boyfriend’s tales, his watercolors, and my interest in the work of Barbara Hepworth resulted in my joining Dacey’s Tour of Cornwall in June 2014. I have not been sorry. Cornwall is beautiful and the tour allowed for two days in St Ives, a place I wish I could stay for ever. Barbara Hepworth must have felt similar enchantment when she arrived there in 1939. She lived in St Ives thirty-five years and created there her most important works. 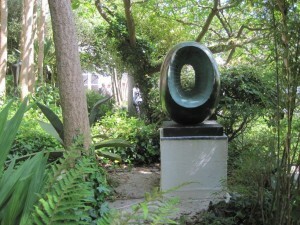 Her studio and garden opened to the public in 1976 as the Barbara Hepworth Museum and Sculpture Garden. The village of St Ives, proud of the artist, granted her the title of Bard of Cornwall and the Bardic Name Gravyor (sculptor.) Hepworth’s works can be seen on the winding streets overlooking the harbor and in the Tate Gallery St Ives branch. In 1925 she married a sculptor, John Skeaping, with whom she had a son Paul. After Paul ‘s RAF plane crashed over Thailand in 1953 Hepworth carved Madonna and Child, and gave it in his memory to the Parish Church in St Ives. The greatest love of her life, however, was an abstract painter Ben Nicholson. She met him in 1931 and had triplets (two girls and a boy) by him in 1934. They married in 1938. At the outset of World War II, in 1939, the couple moved from London to St Ives with their four small children trying to meet ends and survive. In 1949 Hepworth bought Trevyn Studio (presently The Barbara Hepworth Museum and Sculpture Garden). Seeing it for the first time she said: “Finding Trevyn Studio was sort of magic…Here was a studio, a yard, a garden where I could work in an open air and landscape.” The beauty of St Ives enraptured her. She loved the simplicity of life there and the sense of community which is tangible in the village even today. Hepworth and Nicholson divorced in 1951. The artist stayed in St Ives and lived alone until her tragic death in a studio fire in 1975. Frail and suffering from cancer and arthritis, she was unable to call for help, or perhaps unwilling to live any longer. Hepworth achieved fame and success during her lifetime, her works are in every major museum in Europe and in the Unites States. She represented United Kingdon in Venice and São Paulo biennials, was granted the title of Dame of the British Empire by the Queen, and held exhibitions all over the world. Her large bronze, Single Form 1961-64, standing 22 feet high in front of the United Nations headquarter in New York, was created to reflect the nobility of Dag Hammarskjöld, Secretary General of United Nations and close friend of Hepworth. The Hepworth Museum and Sculpture Garden allows the visitor to see the artist in context of her life. Her former living quarter is presently filled with her smaller works including an early work, Infant 1929, carved in wood the year her oldest son was born. Motherhood was an important inspiration in Hepworth’s work. She carved, several versions of Mother and Child from figurative in the late 1920s to more abstract in1934. The Garden, which she created herself, is magical. It is the best outdoor gallery for her monumental bronzes and limestone sculptures. The works seem to maintain a lively dialog with trees, bushes, and flowers in bloom. Pierced with circular apertures, the sculptures allows for multiple views and project mysterious shadows on the ground. In the garden is also Hepworth’s studio equipped with all her tools as she left them on a worn-out wooden table or hooked to the wall. I was amazed how many mallets, hammers, and carving knives she used. Hepworth’s sculptures are an attempt to keep firm footing in the world which has been often difficult to live in. The feeling of impermanence and loss which have been part of her experience, but also love, motherhood, and friendship found expression in her work. In addition to almost 600 sculptures, Hepworth made a series of little known pencil, ink, and chalk hospital drawings observing surgeons operating on patients. I have seen a selection of these drawings in the Royal Albert Memorial Museum in Exeter during one of the stops of the Dacey’s Tour of Cornwall. Penelope Curtis, Barbara Hepworth, Tate Publishing, London, 1998 and 2013, p. 49. Some Statements by Barbara Hepworth, Barbara Hepworth Museum and Sculpture Garden, p. 6, published in a free brochure available to visitors.